Pictured: High school students work with a manikin in the SimTiki Lab. Deborah Manog Dimaya photo. 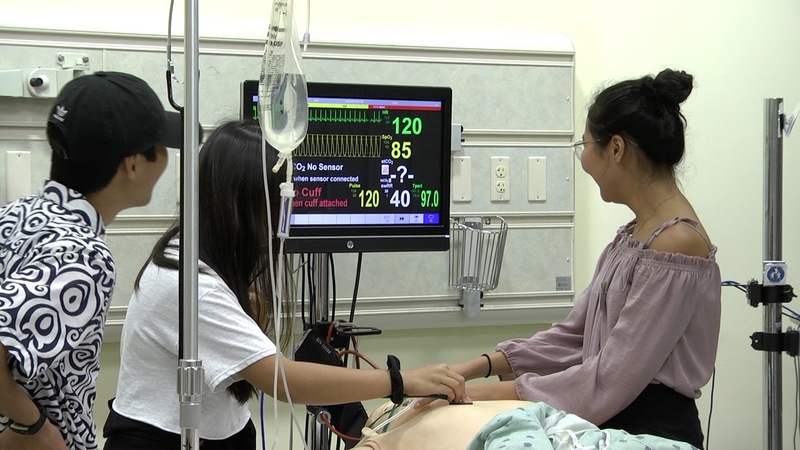 High school teenagers are preparing for a future in medicine through the Medical Diagnosis and Treatment summer program offered by the University of Hawaii (UH) Manoa Outreach College. The five day course at the John A. Burns School of Medicine (JABSOM) exposes high school students to health care through hands on learning of CPR, suturing, how to take vital signs, gross anatomy laboratory demonstrations and computerized manikin simulations. The students even get the chance to interview and counsel mock patients. “We would first knock on the door three times, introduce ourselves to the patient and question them based on their condition. Then we diagnosed the patient and gave them a follow-up and treatment based on what we learned this week,” said Kelly Li, Honolulu native. Although Li is still in high school, she was excited to narrow down potential job choices so that she can focus on pursuing the career she wants. “After all the different workshops, I was able to find out what things I enjoyed or not,” Li said. Lauren Froerer, California native, and her family are vacationing in Hawaii for several weeks and thought entering the program would be a great opportunity. “My mom told me about it (the program) and I’ve always been interested in learning about medical things. I’ve also considered going to school here so I figured I’d get a better idea of what that would be like,” Froerer said. Applications are now being accepted for the summer program until June 1st. For more information, contact Noelani Ching at nching@hawaii.edu or call her at 808-692-0948. The application can be found at the UH Outreach College website.